At present I am presenting a series of posts that re-interpret the history of Clan Gunn up through the battle of St. Tears. Where possible I have attempted to cast the facts of the story in the wider context of Scottish and Norwegian history and politics. Some of this new work may eventually be proven wrong. Readers should not take umbrage if they find their closely held beliefs challenged here, no offense is intended, none should be taken. Another gem from St. Magnus – Earl of Orkney by John Mooney.. 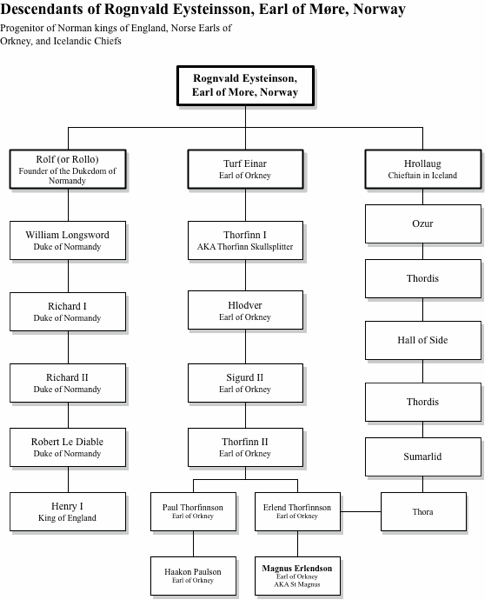 This chart shows the family connection between Malcolm II, King of Scotland and the Earls of Orkney, including Magnus Earlandson. 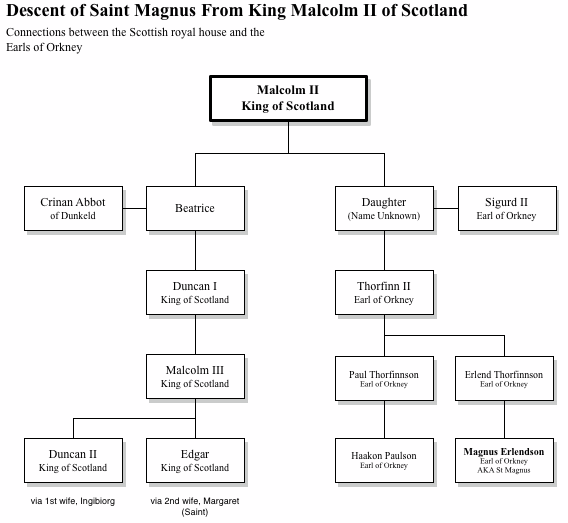 As it turns it, Malcolm’s bloodline also connects the Earls of Orkney to King Magnus Barelegs of Norway, and Henry I of England. When Sigurd II died at the Battle of Clontarf, Malcolm II raised young Thorfinn at the Scottish royal court, and later granted him the title of “Mormaer of Caithness”. Because of this bond, Caithness was largely under the control of the Orkney Earls until the treaty of Perth. Below is a rendering of a chart showing these family ties for further study. Clicking on the image (or here) will open a high-resolution PDF version. 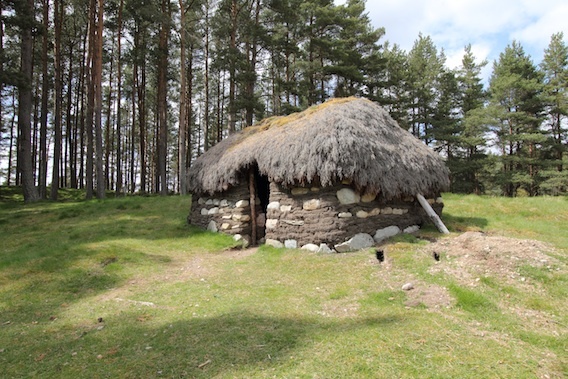 One of the great resources that has furthered my understanding of Knockfin, and the nature of a small highland village has been the Highland Folk Museum in Newtonmore. For my trips to Caithness, it is conveniently located on the A9 in the highlands as I drive north from Glasgow. Started in 1935 by Dr Isobel F. Grant, the museum captures a model of rural village life in Scotland in several periods, including the 1700s. 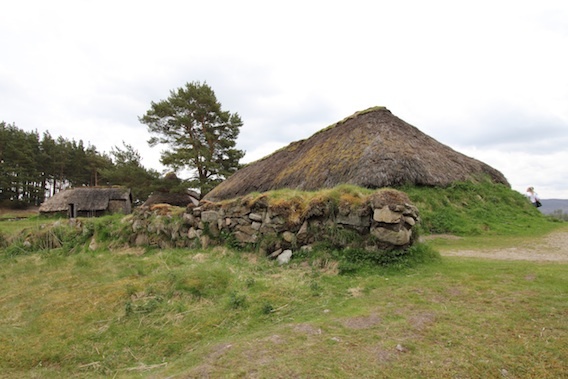 The 1700’s highland village, “Baile Gean” is located at the south end of the museum grounds, and features a number of re-created highland blockhouses that seek to interpret the types of dwellings found in a typical highland village. In includes the main village house, or the Tacksman’s house, a Cottar’s house (poorer crofters), a Weaver’s house (craftspeople who many not have farmed at all) and a Stockman’s house (crofters who kept livestock). 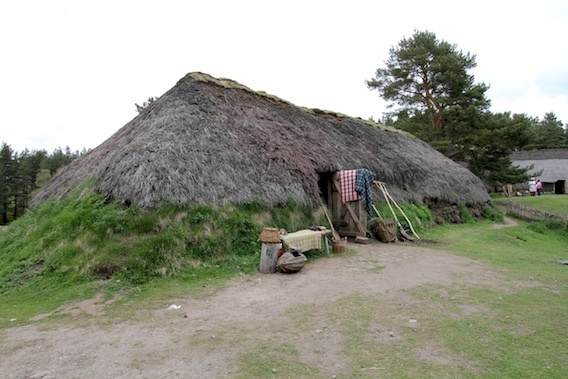 All of these structure follow the type that would be considered a typical highland “Blackhouse” due to their central peat-fired hearth and low thatched roofs. 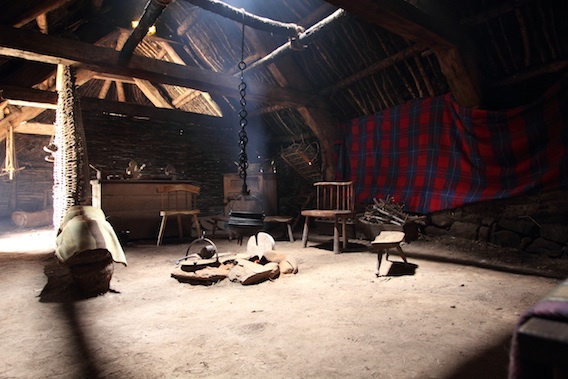 Blackhouses were named thusly as the soot and peat smoke would build up on the couples, rafters (aka Cabers) and the thatch until the entire interior would turn black. This thatch would be replaced and the sooty material would be used to fertilize the fields. Interior of the Tacksman’s house with central hearth and low “creepie” chairs. Tartan rugs decorate the walls. The village would have a lead family, who held the tack for the village. The tack was the lease or deed from chief or laird for the land and holdings encompassing and worked by the village. The job of the Tacksman was to ensure that rents were collected and paid either in coin or in produce. Their recreation of the town is based on the floor plans and foundations discovered through archeology of several sites, and study of old structures and long experiments of trial and error where the conservators and staff made multiple attempts to build actual blockhouses and township support structures. 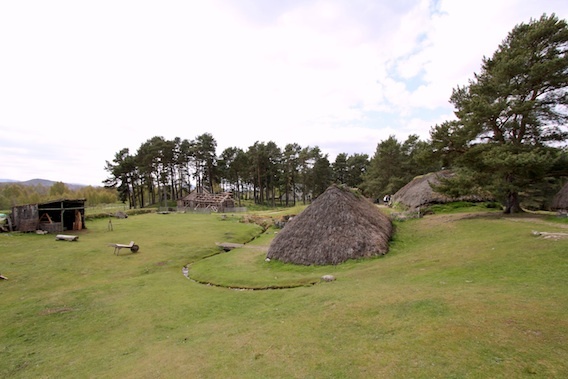 Baile Gean township showing multiple high-quality recreations of highland blackhouses. Much like Knockfin, Baile Gean contains a variety of houses of different sizes and purposes, arranged according to convention and custom. In the case of Baile Gean, the doorways all face as close to East as possible, as it was considered good to have the morning sun great you. In Caithness this was quite impractical, as gale force winds heavy with rain would blow from the sea just to the east. Instead the doors to the blackhouses in Knockfin all seem to point south, again to capture what sun they can. Much to my delight the buildings at Newtonmore / Baile Gean include a barn, a grain kiln, and sheiling huts, which were features of the village at Knockfinn as well. In the subject of Sheiling huts, these rough shelters were built in the high pastures, they were home when the herds were taken upland to graze in the summer. Frequently this was the work of the women of the village, and these huts provided sleeping shelter, as well as storage for butter and cheese made from the milk harvested during the summer grazing. Additional high-res photos can be found in the Ramscraigs photo gallery. One of my prized old books is a work from the early 20th century entitled St. Magnus – Earl of Orkney by John Mooney. Within it’s pages are a great wealth of information about Magnus Erlendson, who later became St. Magnus, the patron saint of the Gunns and a important figure in the history of our ancestors. Among the many treasures in its pages are a series of genealogical tables describing the noble families of Orkney, Scotland, Iceland and Norway. Below is a rendering of that table for further study. Clicking on the image (or here) will open a high-resolution PDF version. Scotland was not always as we think of it today. In fact it was composed over centuries by consolidating multiple minor kingdoms and territories into a single unified state under a single king. Starting in the twelfth century, the Scottish kingdom came increasingly under Norman influence. During the twelfth and early thirteenth centuries, the Scottish crown and the Norwegian Earls of Orkney somewhat shared the rule of Caithness and Sutherland, while Norway exclusive rule of Orkney. During this period, the tribal confederation that would become the Gunn clan controlled a significant portion of the land in Caithness and northern Sutherland, and in many regards functioned as the government for the territory due to their cohesion, wide land holdings and generally fair minded approach to rule. It is quite likely these early Gunns maintained close ties to their kin and friends in Orkney, and members of the Norse families may have even kept ties with Norway. Across Gunn controlled areas, the people spoke a mix of Gaelic and Norn, a form of norse language that had been regionally adapted. They would have paid taxes to the Norwegian Jarl in Kirkwall, and would have attended churches organized under the Orcadian bishop. During the thirteenth century, the Scottish kings, seeking to consolidate their kingdom, repeatedly offered to purchase Scottish territory that was under Norwegian rule. This included the western Hebrides islands, the Kintyre peninsula and the Isle of Man. The Norwegian crown held no interest in giving up these important lands, and repeatedly refused these offers. With the ascension of Scottish king Alexander III, Scotland gave up on purchase and used force to make their point. In the summer of 1262, Scottish forces began raiding the islands, beginning with Skye. Outraged by this provocation, Norwegian king Hakon IV assembled a massive fleet of longships to drive the Scottish back and reclaim their lands. His battle fleet first sailed to Orkney, where they were no doubt reinforced by Caithness and Orkney fighters and additional warships. The sight of over 100 warships, crewed by battle hardened Viking raiders and skirmishers, sent a clear signal to Alexander III – we will not give you that which is rightfully ours. Upon reaching the west coast of Scotland, Hakon’s fleet anchored near the Isle of Arran, where they were joined by allies from Skye, Islay, Jura, Mull and Man. Impressed with this show of force, King Alexander III dispatched an envoy to discuss terms with King Hakon, while the Scottish king marshaled his forces to repel the Norsemen by force. Due to the Scottish crown’s long and fruitful relationship with the Norman French, this force had at it’s core units of heavily armored and well trained vassal knights and heavy infantry. Upon arriving at the anchored fleet off the west coast of Scotland, the envoy complimented Hakon, and once again repeated Scotland’s offer to buy the lands he controlled in Scotland. 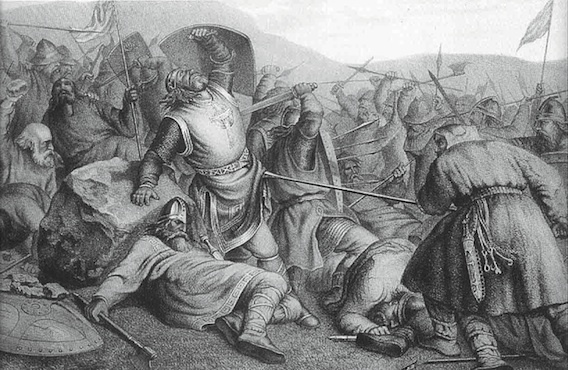 While discussions between the envoy and Hakon continued, the Scottish king moved his forces, including a core of heavily armored Norman calvary and foot-soldiers to Largs, where the Norwegian force was anchored in a storm. While a small Norse party was ashore to rescue a stranded ship, they were attacked by the Scottish forces. The norsemen were outnumbered 10 to 1, and a storm kept the bulk of Hakon’s forces aboard their ships anchored off shore. Stalemated by the large, heavily armored force on the shore and the approaching winter, Hakon decided to withdraw his forces to Orkney to await the spring. Unfortunately for the Norse, King Hakon died in Orkney that winter, and his successor, King Magnus VI, decided to accept Scotland’s offer to sell the disputed territory. In the treaty of Perth, Scotland gained solid control over all lands to the north of England, while ceding claims to Shetland and Orkney. As a result, Sutherland and Caithness changed hands from Norwegian to Scottish rule. Scotland would have a difficult and rocky road to bring the Viking north to accept and follow their rule. With the Gunn clan / syndicate as the functional government, Scotland would have to deal with them or conquer them to make any progress. This reality would give rise to tensions as Scotland tried and failed to implement feudalism in their new territory in the coming decades, which would eventually drive the crown and their appointed Norman Earls to actively break up the Gunn territory and clan cohesion, eventually leading to a final conflict with the Anglo / Norman Keiths. While at first there was little dramatic change for the robust and prosperous Gunns of Caithness, the wind of change was blowing, and not in their favor. During the years that Earl Rögnvald held power in Orkney and Caithness, Scotland was undergoing an age of significant transformation towards a feudal society that would later be at the heart of the conflict that would bring about the battle of St. Tears and the destruction of Clan Gunn. The King of Scotland at this time ruled under the name David I, and was so influential that a period of his reign is frequently referred to as the Davidian Revolution. David spent his childhood years in the court of King Henry I of England, and while there gained an appreciation for the Norman approach of feudalism, where landed vassal lords and their retainer knights and lesser nobles controlled the populace. Feudalism and the time in which it happened across most of Scotland plays an important role in understanding the events that led to the Battle of St. Tears, specifically of note the Norman feudal system and the Norse approach to governing were different and distinct. During the rule of King David I of Scotland, he began to implement a broad program of Normanization. This period was characterized by his import of Norman / French and Norman / Anglo knights to become the instruments of implementing his feudal system. Feudalism revolved around royal land grants, known as Fiefs, that bound the person receiving the land, known as a vassal and the person granting, known as a lord together in an economic, military and in the Norman case religious alliance. During this period David I granted numerous parcels of lands to these knights, and trusted in them to maintain order and control over the Scottish peasants. David I also undertook a broad effort to re-shape the central Royal Scottish government to be more like the government of Anglo-Norman England. In part this may have been based on his childhood in the court of Henry I of England. It was during this time that a Norman / French family, the St. Clairs became lords of Roslin, near Edinburgh. This family will, centuries later, scheme for the Scottish throne and become the Earls of Caithness. It was during the reign of David I that religious hagiography began to rise in Britain. Hagiography is the study, reverence and worship of saints. From this focus on the power and majesty of God, the King and his noble subjects derived what has been described as “Divine Right“. Under the principles of divine right, the monarch and by extension his vassals derive their right to rule over the people directly from the will of God Almighty. A later Scottish King, James VI would write, “According to the text, a good king “acknowledgeth himself ordained for his people, having received from the god a burden of government, whereof he must be countable”. Divine right in many ways clashed with the existing spiritual and cultural systems of the indigenous Scots, who had become Christians via the Gaelic / Irish church, and functioned via small local government that operated via tribal council and chiefs selected by leading men of each area or village. The notion that some strange French man had been ordained by God to rule over them must have seemed quite absurd. With these Norman lords and knights came another new social practice, the tradition of passing title, land and holdings to the first born son of each family. This is known as primogeniture, and like the concept of divine right and feudal lords, was completely alien to the Scots. By tradition, the title of the leading man for a family, area of village was frequently passed through the maternal line, or transferred while the holder was still living to the man determined to be the most capable of carrying out the best interests of the tribe of community. For the Norse, inheritance of titles and land was divided among children, and not always just male children. This custom resulted in such situations as there being as many as 3 Earls of Orkney at the same time. Again it’s important to note that Caithness and Orkney were still under Norse rule at this time, and the norman feudal system, divine right and integral primogeniture would not arrive in the North for many decades to come. When Caithness eventually became Scottish, this culture clash would take more than a century to resolve, and would play an important role in setting the stage for the final battle of Clan Gunn. It is impossible to make sense of what happened at St. Tears without understanding the ancient Gunn clan, and how that influences the event leading up to that pivotal moment in their history. The Gunns are an ancient family that are blood descendants of Norwegian settlers of Orkney and Caithness. For a number of years they were the power in the north, and resisted external authority with guile and cunning. The story behind the Gunns starts in Orkney, an archipelago to the north of Scotland. Sometime in the 10th century, it began to be colonized by men from Norway. The world was enjoying what was to later become known as the “Medieval Warm Period“, when temperatures were significantly warmer than they are today. Bathed in the currents of the gulf stream coupled with long spring and summer daylight hours, Orkney must have seemed like a fertile paradise to young men looking for opportunity away from Norwegian shores. Orkney’s waters teamed with fish, and the gentle rolling hills were arable with some hard work and careful planning. The Norse settlers found the islands already inhabited by Celts and Picts, who were farming the land and enjoying the bounty of Orkney. But the population never saw a massed invasion of horned-helmeted viking warriors swarming ashore from dragon-headed longboats in Scapa flow. These men of the north came in peace, and worked hard to integrate with the local people. In time the king of Norway set up a government in the islands headed by a Jarl (Earl) of his choosing. 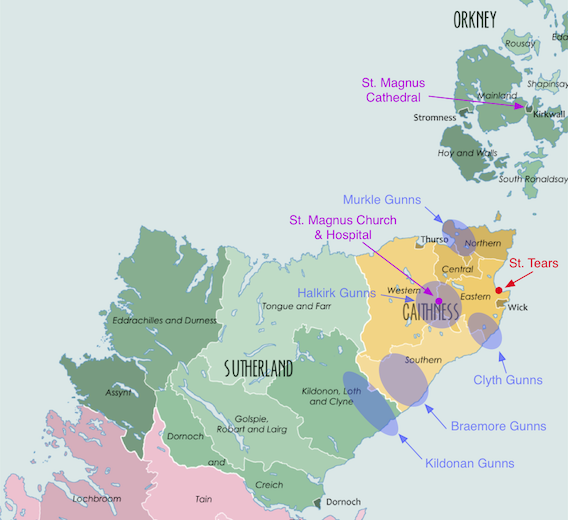 The line of the Orkney Jarls inter-married with the local people, and with the chieftains and Moramers in Scotland. By all accounts it was a time of peace and prosperity. 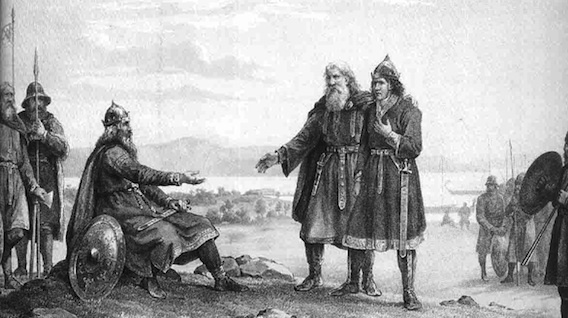 Little is made today of the importance of Magnus Erlendsson to Clan Gunn. This can be attributed to a number of factors that I hope to discuss in more detail in the coming months. During the late 11th century, the Earldom of Orkney was shared by two men, Haakon Paulsson and Magnus Erlendsson. Today it would seem very strange that any king would force two men to share rule, but most of our notions of nobility come from Norman rule of England. Norse customs and traditions are different than those of the Norman French in terms of lineage and inheritance. Modern notions of hereditary leadership revolve around the notion of primogeniture, the practice where the eldest male child assumes all titles and possessions of the father upon his death. To the Norse (and by extension the Gunns) this would have seemed alien and barbaric. Titles and possessions were divided among the male heirs of age, so a local chief that had three sons would result in three chiefs where there had been just one. In Norse customs, all three held equal claim to their father’s legacy. Such was the case in the earldom of Orkney, where two cousins, Haakon and Magnus, shared lordship of the isles. Eventually the title was consolidated under Haakon after he had Magnus killed on Eligsay in 1117. For his martyrdom, Magnus was eventually elevated to Sainthood, and became one of the most important religious figures in northern Scotland for several hundred years. Part of that elevation was thanks to his nephew, Rognvald, who years later took up the title of Earl of Orkney, and built a great cathedral in Kirkwall dedicated to his uncle, St. Magnus the Martyr. Gunn legend tells that their founding ancestors included a member of this noble house of Norway, a grand-daughter of Earl Rognvald (later St. Rognvald) named Ragnhild, who would go on to become the mother of Snaekoll and the provider of the Gunn lands in Caithness. As the grand-daughter of the Earl, her dowry included many lands in this southern provence of the Orkney Earldom. While the majority of the Norsemen on Orkney were merchants, craftsmen and farmers, there were some notable vikings and warriors. The Gunns claim heritage from one particularly famous fellow, Sweyn Asleifsson – ‘The Ultimate Viking’. Sweyn is a fascinating fellow who merits a great deal of study, but suffice to say he became a fast friend of Earl Rognvald, even though many times they were at odds over important matters of the day. While Rognvald was a skillful statesman and diplomat, Sweyn specialized in raiding, looting, pillaging, revenge and all the other activities we tend to associate with Vikings. Where Sweyn enters this story is through his grandson, a man named Gunni, who becomes the husband of Ragnhild, Earl Rognvald’s grand daughter. The Orkniga Saga includes mention to the last days of Earl Rognvald, where he is in Caithness a few days before the battle that ended his life. In the Saga it is mentioned that he is attending a wedding in Berriedale. It’s tempting to think that this might have been the union between Gunni and his granddaughter Ragnhild, and Berriedale would put it squarely at “ground zero” for our story. Again the modern notion of clan and family might prevent us from seeing the past. Many believe that families with a given clan surname are all descended from a single male clan chief. Thankfully DNA testing has provided ample evidence proving this is typically not the case. For the Gunn clan, it’s formation was more of a federation or syndicate. There were many strong local chieftains in the land that Gunni and later Snaekoll ruled. Rather than assume they used the Norman approach of conquer, subjugate and oppress, they likely followed the path that had worked so well in Orkney. Form alliances with like minded leaders and organize them towards a common good. Halkirk / Spittal – Strath inland from Clyth – south of Thurso and west of Wick. This was home to the Gunn high church at Spittal, dedicated to the Gunn patron Saint, St. Magnus the Marty. Murkle / Castlehill – On the north shore east of of Thurso. These five region groups all contributed men to the derbhfine (the clan’s ruling body), and rotated the Chiefship among them. Rules and laws would not have necessarily been handed down autocratically, but would have been the result of Nordic councils / parliaments known as “Things” that would be held periodically to address the needs of the times. In summary – it is likely that the Gunns consolidated several allied chiefs in Caithness when they took control over lands inherited by Earl Rognvald’s granddaughter, Ragnhild. These ancient Gunns believed that they had the blood of saints (both Magnus and Rognvald) and the ultimate viking (Sweyn Asleifsson) in their veins. The coalition they formed operated under the banner of “Clan Gunn” and for centuries proved to be peaceful and prosperous. The affiliated tribal areas each had their own distinct approaches and customs at first, but the operated together for the common good. In fact it was so successful and so stable, it was unchallenged until Norman Scots began to try and assert feudal power in Caithness as Norweigan power waned in the 14th century. While all of this may seem meaningless at first, these aspects of how Clan Gunn started, the regional sub-tribes and ties to Orkney, Norway and the patron Saints play an important foundation in revisiting the legend of St. Tears. Like most interested in the history for Clan Gunn, I have studied the multiple versions of the Battle of St. Tears that have been written and compiled by prior historians and story tellers. The best of these efforts are contained within Mark R. Gunn’s History of the Clan Gunn. Each telling of this tale follows a similar path – after a long standing feud the Gunns and Keiths declare that they will meet at the St. Tears chapel near Girnigo, and each side will bring twelve horse of men. The Gunns, ever valorous and honorable, arrive and enter the chapel to pray and wait for the Keiths. The dastardly Keiths arrive with two men on each horse, breaking the spirit of the agreement but not the letter. Outnumbered 24 to 12, the Gunns are ravaged in valiant battle, a blow from which they never recover. The clan fractures with sub-factions going their own way. My own ancestors following Henry Gunn, and forming what came to be known as the Hendersons of Caithness. Like most of you good people, I took the ancient tale at face value. After all, what else did we have to work from? I hope to answer that question shortly, but first let me tell you why I came to decide that this grand story is in fact not quite as accurate as we would hope. Let me get this right, the canon story of St. Tears requires us to believe that after over 100 years of bitter feud, including the kidnapping and death of a bride on her the eve of her wedding, that the leader of Clan Gunn – himself a savvy and battle tested warrior, would for a moment take the word of the Keiths to play by any rules? Would a clan that wielded as much power as Gunn show up to such an event with anything less than a massive show of force? The story leading up to St. Tears states that the chief had twelve sons, and that these twelve sturdy men were the force that arrived at St. Tears to settle the age-old feud with the Keiths. Even if George had twelve sons, why would all of them be present? What father would risk his entire family on a weapons laden encounter with your enemy? Are we expected to believe that the fruit of George’s loins were the men most capable of holding a sword among the hundreds or thousands of Gunn warriors in Caithness? In the well known story, several of the Gunn party at St. Tears survived, not the least of which is Henry Gunn who took revenge at castle Dirlot, and the Crowner’s oldest son James who claimed the chiefship after his father’s death. If the origin of family names, Robert Gunn also survived as did William Gunn and Sweyn Gunn. Come to think of it, quite a few of the Crowner’s sons seem to have survived St. Tears. If you are the Keiths, and you know that you outnumber your enemy 2:1, would you let any of them survive? You can count on the fact that they will be back in force to extract their revenge. In fact this cycle of attack and revenge been going on for decades. Are we to believe that the Keiths showed mercy to the Gunns at the exact moment when they held their doom in their gauntlets? Simply put, a critical look at the story of St. Tears seems to indicate that the legend may not be the whole story. Understanding what was happening to the Gunns and the Keiths at that time, and how Clan Gunn actually worked is the key to peeling back the varnish of multiple legends to try and take a guess at something that could be closer to the truth. I hope to be able to provide that soon. Until then I encourage readers to think about the battle of St. Tears, and how much of it is unlikely because it defies both common sense and subsequent history. I have added a photo library to the site, which will be used to store photos from the research as well as the expeditions to Caithness. You can find the link over on the right hand side of the page under “Resources”. Little discussion of Henderson history during the early years in Scotland can take place without an understanding of the Scottish clan system, and how their customs and traditions shaped the political and social landscape in which our ancient ancestors lived. The term “Clan” is from the Gaelic tongue, and literally means “family” or in some sense “tribe”. Our modern notion of Clans comes from fanciful stories, movies and a romanticized image that came about during Victorian times, with what some Scots call the “Balmorification” of the Highland culture. Because most core Scottish culture has been driven underground or banned outright by the act of proscription following Culloden, a new prologue for highland life was created as it became fashionable to be Scottish in the 1800s. The clan was an evolution from Pictish / Celtic iron age “tribes”, where people banded together in confederation for community, defense and commerce. Contrary to popular belief, the members of a given clan are and were not all blood descendants of a single male progenitor, as is the popular notion. Members of a given clan could be part of the chief’s direct or extended family, or could be tenants on his lands, friends or companions of his or his kin, or families that lived within the clan’s area of influence. The members of the community, or clansmen, gave their loyalty to the clan chief and in return he gave them protection, justice, and leadership. Clan Henderson DNA project has proven this to be the case with several branches, including the Caithness Hendersons from Clan Gunn, which show at least 3 major bloodlines. Within a clan, all functions of government took place including laws, customs, justice and legal frameworks, treaties with other clans (even other countries in some cases!) and to some extent, religious functions. The Clan chief was monarch of this community who held ultimate power and responsibility for the welfare of his clan. The chief’s court and government typically had high officers and wise men of the clan. This included the designated successor to the chief, sometimes known as the Tanist – who was many times not the chief’s eldest son, the Champion or Commander who led the clan in battle and was responsible for security of the chief’s lands, the Brieve (judge) who administered the laws of the clan and the crown, as well as bards (responsible for documenting the clan’s history) and doctors. The leading men of the clan were the derbhfine. These were the not always immediate children or brothers of the current Chief, but were generally within 4 generation direct kinship to the current chief. They were the men that the Chief relied upon for counsel, and to carry out the daily functioning of the Clan government. This group of men would be tasked to select the next chief in event the current chief should die in battle, from disease or old age. The frequent recitations of a clan’s genealogy by its bards was therefore a reminder of who was currently in or out of the clan’s derbfine as much as it was a claim to ancient lineages. The chief’s children were frequently raised for part of their lives away from the clan court. This tradition known in english as “Fosterage” was an important way to reinforce the social ties between allied clans. At a young age, children of the derbfine would be sent to the household of relatives of the leading clan gentry. This meant that traditionally, some portion of the next generation’s upbringing would be within a family of an allied clan. This fostered intense loyalty and inter-clan ties. Below them was a group known as the duine-uasail, or the gentlemen of the clan. They would frequently be minor chiefs in their own right, holding the land in a given glen or toun and enacting the Clan’s government on behalf of the chief. Below them were the common folk of the clan who may or may not be related by blood to higher ranking members. This system would often lead to rotation among the leading branches of the clan taking leadership for a generation. The average lifespan in the middle ages was shorter than required for a chief’s children to reach an age to be considered for selection as the Tanist or heir-apparent before he died. This method of succession then saw leadership trade off between core family groups of the clan, creating a balance that helped ensure patrilineal tyranny could not take root. When the new chief took charge of the clan, the next Tanist was elected by the derbfine and duine-uasail to fill the position vacated by the one now risen to chieftainship. He may have come from the branch to which the deceased belonged, or may have been from one of the other related cadet branches. The next succession would be handled in the same manner. If a chieftain attempted to have his own son (or brother) chosen over the choice of the ruling council, the electors were outraged, as they feared subjugation to one branch. This system of checks and balances kept the leadership of highland clans true to their purpose of leadership and benevolence towards the clan. Tanistry as the system of succession left the Chief position open to those who were ambitious and dedicated to the clan. But it was a frequent source of conflict both in families and between clans, though at the same time it created a democratic monarchy. Tanistry was abolished by a legal decision during the reign of James VI of Scotland, who later became James I of England and Ireland. At that time the feudal system of primogeniture (eldest son assumes rulership) replaced the old highland way. We can safely assume that some of the Crowner’s sons had been fostered with the Sutherlands, the Cheynes and possibly the Sinclairs. Our oldest surviving records show close bonds between our direct Henderson ancestors and the Sutherland family in Berriedale, where they had held power for some time before the Sinclair’s for Freswick took over the the late 1700s. During the 1400s, when George Gunn was chief, they were still a very powerful clan that governed the flow country from Clyth in the north to Brora in the south. George had several sons, all of which would have been members of the derbhfine, or clan princes. We can also assume that George’s brothers and several cousins would have made up part of this ruling council. History describes several branches of the Gunns, including Braemore, Dunbeath and Latheron. Each of these regions would have been the responsibility of a member of the derbhfine, and would be represented either at the great hall in Kinbrace or at Clyth when the chief held court. In terms of our ancient Henderson and Gunn ancestors, we can assume that James, the Crowner’s oldest son was likely the Tanist, while there are ample indications that Henry was likely the Gunn Champion or Commander. Given that many of the derbhfine would have perished in the battle of St. Tears, it is possible that there was no consensus on the next chief, which fueled the conflict which eventually led to Henry’s departing and forming his own Henderson clan. The origin of the Hendersons of Caithness runs through the tower of Ackergil. The great feud between the Gunns and the Keiths which eventually sundered clan Gunn, and formed the Hendersons, has its roots here. By the mid 1400s, the Keiths began to openly challenge the Gunns for supremacy in Caithness and Sutherland. The story of Ackergil begins further south in Braemore, to the west of Berriedale and Ramscraigs. In mid 1400’s, the local chief, Lachlan Gunn of Braemore, was to marry his daughter Helen of Braemore to distant cousin Alexander. Helen was reputed to have been of unparalleled beauty, and she had caught the eye of many local men, including Dugald Keith of Ackergil. Dugald had campaigned for her hand, but Lachlan Gunn held no interest in marrying his daughter to the Keiths. Not content to lose her to another, Dugald mustered a group of clansmen and made their way south to Braemore. On the eve of Helen’s wedding night, the Keiths besieged Lachlan’s great hall, trapping Helen and a large number of feasting wedding guests inside. Pledging safe release for all if Helen surrendered to him, she was bound and taken north to Ackergil. With his prize claimed, Duglad Keith set the Braemore great hall ablaze, burning the wedding party alive. At Ackergil, Dugald Keith locked Helen at the top of the tower, vowing to win her love no matter how long it took. As the days passed, Helen became increasingly despondent. One evening at sunset, she managed to distract her guards, and flung herself from the tower to the courtyard below. This bloodshed between the Gunns and Keiths began what would be a 500 year feud that would eventually sunder the Gunns and render them defunct as a power in Caithness. In May of 2010, I was fortunate enough to visit Ackergil, which is now a very pleasant house that is frequently rented out for weddings and ceremonies. One of the emotional moments of the this spring’s trip to Caithness was an expedition early in the morning of my last day in Caithness. I have read and written about the pivotal battle at the Chapel of St. Tears, where the Gunn clan was slain by an overwhelming force from Clan Keith. The morning was bright and warm, especially for Caithness. The locals were very tolerant of a large American stumbling around their fields, and eventually they helped put me in the right area. The site of the chapel is a few yards from the shore between Ackergil and Girnigoe? castles, and much to my surprise is marked by a small memorial stone, shown above. On this site, I could not help but think what impact the Gunns would have had on Scottish history had the fight never happened. The Gunns resisted the feudalization of Scotland, and their elimination as a force in the north removed a counterweight to the Sinclairs, the Sutherlands and the Mackays. After St. Tears, the Gunns never again held their hereditary role of arbiters and enforcers in Caithness. One could imagine what Scotland might look like had the Kildonan, Langwell and Berriedale clearances had not paved the way for so many “improvers” to push the people from the land. During my trip this spring to Caithness, I had a few hours to spare thanks to major road work to repair the Berriedale Braes. As a result, I went to Wick and spent time at their fantastic heritage center. Their extensive artifacts and holdings include many items from Wicks history, with a special focus during the herring boom. The friendly staff had a surprise for me, contrary to what I had been told, the Johnston collection of glass photographic plates had not all been lost. In fact many hundreds had survived. In fact they have taken the time to catalog and index them, allowing visitors to look for scenes of interest. 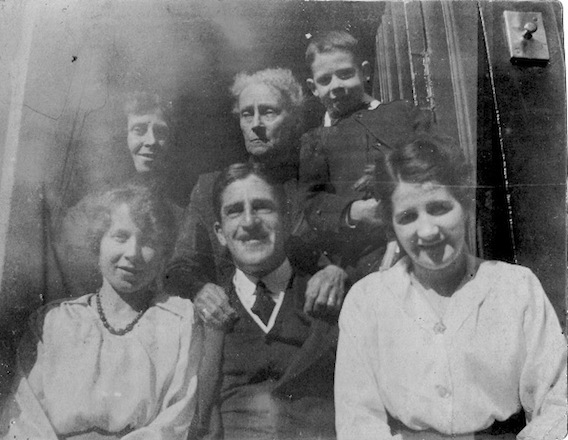 Immediately I began searching for my Henderson kin, and sure enough several Hendersons from Ramscraigs and Dunbeath had their portrait taken on glass plates. For a modest fee, the museum staff were happy to scan these plates into JPEG files. 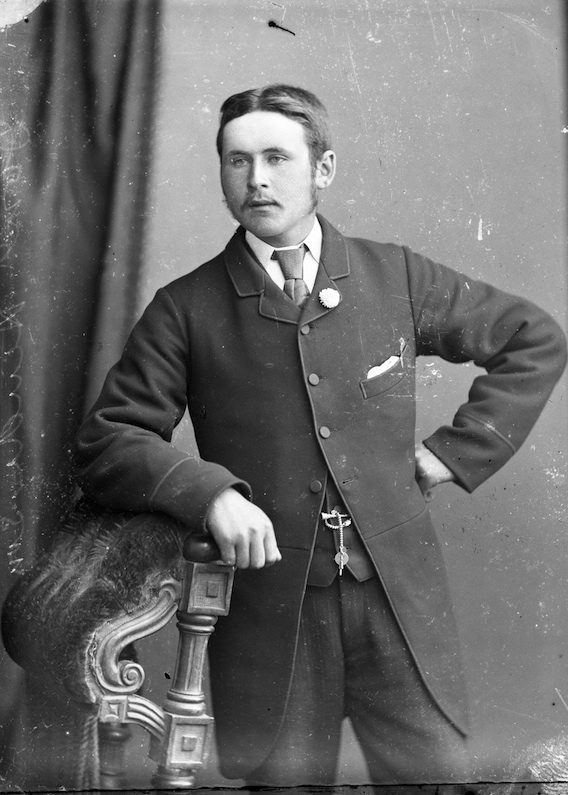 As a result, I am pleased to share the first of these treasures, a photograph of a young Donald Henderson, the grandson of Angus (second son of James of Rhian) born in in 1864. In this photo he is 19 years old. The family likeness, especially with cousin Sally, is wonderful to see. As fortune would have it, I am back off to the UK to visit friends, family and partake in adventure. Plans are to spend several days in Caithness documenting our family history through photos and video, and possibly discover a few new and exciting tidbits of information about our past. This will include a return to Knockfin for a more detailed look, a visit to the “House of Peace” in Ballachly, and hike to the clearance village of Badbea. Updates and photos next week on this site! Thanks again to Sheri for the work that went into finding this photo and sharing it.